Rail operators SMRT and Prasarana Malaysia will form a joint venture by June this year to run the Johor Baru-Singapore Rapid Transit System (RTS) Link. 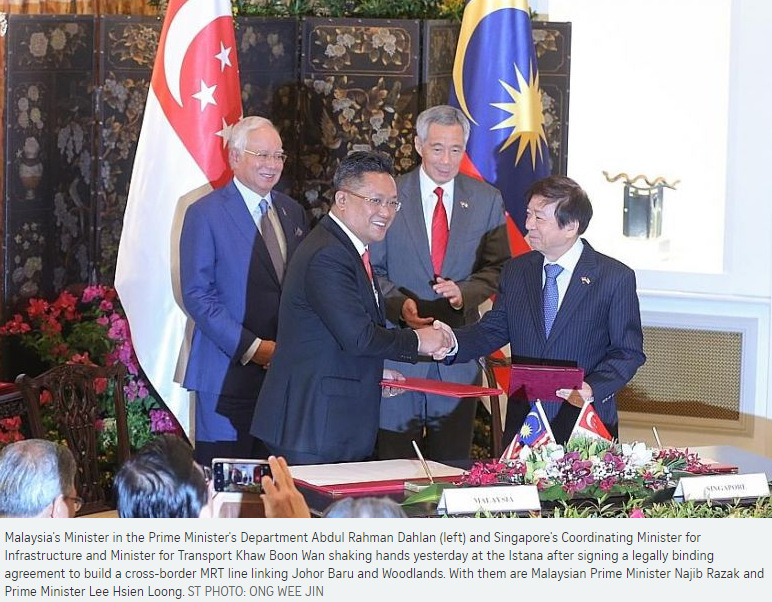 The companies have also committed to sign the concession agreement for the cross-border MRT service by Sept 30, Singapore's Land Transport Authority (LTA) and Malaysia's Land Public Transport Commission (SPAD) said in a joint statement yesterday. This first concession period will last for 30 years. Subsequent concessions will be awarded through open tender. The joint venture company will pay a concession fee to Singapore and Malaysia, and collect fare revenue in exchange. Fares will be set by the company and not regulated by the two governments. 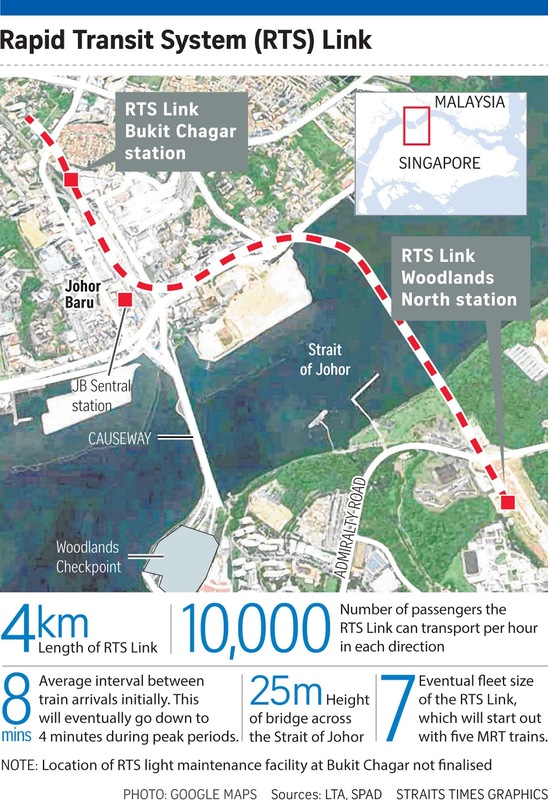 The 4km line will link Bukit Chagar station in Johor Baru to the Singapore terminus in Woodlands North, where commuters can transfer to the upcoming Thomson-East Coast MRT Line (TEL). It will cross the Strait of Johor via a 25m-high bridge in a straight line rather than curving over water - making a bend over land in Malaysia instead. This new alignment addresses the Johor Sultan's earlier reservations about the project. 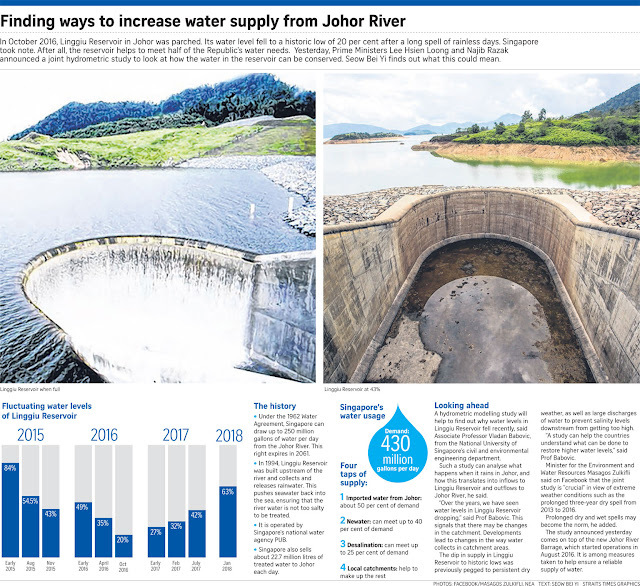 Last August, Sultan Ibrahim Sultan Iskandar had said the idea for a curved bridge was impractical, unsustainable and potentially costly. He also said such a design would disrupt the Johor Baru city skyline, and agreed in November to the construction of a straight elevated bridge for the rail line instead. The Straits Times understands that joint engineering studies found the revised alignment feasible, and that it will make no difference to Singapore in terms of cost or operations. The RTS Link shares the same core systems - including trains and signalling - as the TEL, for economies of scale, said LTA and SPAD. 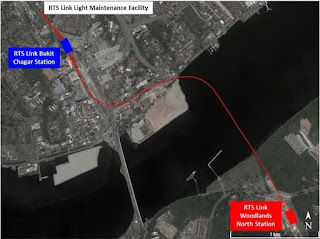 The agencies added that heavy maintenance for the RTS trains will be outsourced to TEL operator SMRT at the TEL's Mandai Depot, while a light maintenance facility will be built at Bukit Chagar. When it opens by Dec 31, 2024, the link can carry up to 10,000 passengers per hour in each direction. This translates to an additional capacity of 60,000 commuters crossing the Causeway during peak hours - the equivalent of about two-thirds the number crossing now. This is much higher than the average 300 passengers per hour in each direction carried by the daily shuttle train service between Woodlands and Johor Baru, SPAD and LTA noted. The Keretapi Tanah Melayu Berhad's Tebrau Shuttle will cease six months after the link begins operations. The shuttle frequency will be increased in the interim to cope with demand. Singapore and Malaysia inked a legally binding agreement to build the link yesterday. It captures key points such as technical, safety and security requirements; commercial, financing, procurement and regulatory frameworks; and Customs, immigration and quarantine arrangements. 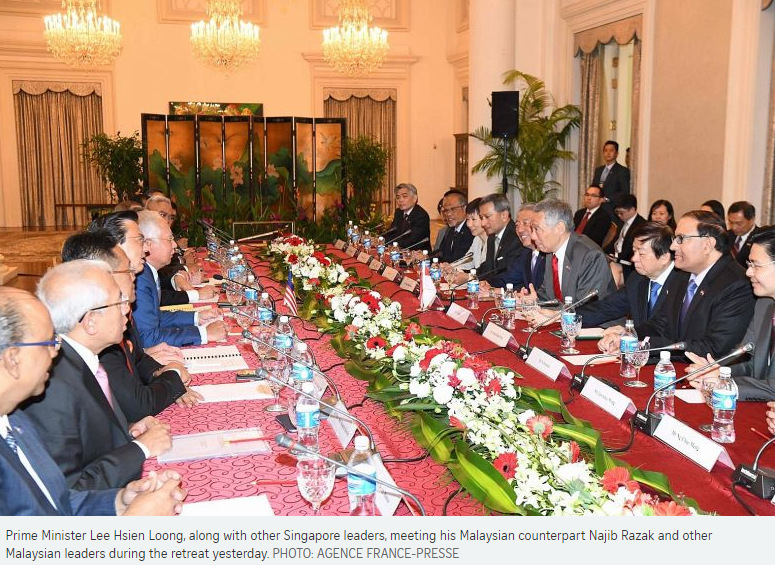 From congestion on the Causeway to the bidding process for the high-speed rail, Prime Minister Lee Hsien Loong and his Malaysian counterpart Najib Razak addressed matters of bilateral concern at a press conference yesterday for the eighth Singapore-Malaysia Leaders' Retreat. The two leaders welcomed the progress made in relations, adding that "tangible results" are produced when both countries work closely together. The next leaders' retreat will be held later this year in Malaysia. To ease traffic jams on the Causeway during peak periods, toll fees for the Second Link in Tuas may be reviewed so more people will use it. Malaysian Prime Minister Najib Razak said Prime Minister Lee Hsien Loong had proposed this solution to the congestion problem, adding: "People from both sides have to wait as long as three to four hours to get clearance, and we both agree that we need to resolve this." The toll charges at the Second Link range from $3.20 for cars to $14.70 for heavy goods vehicles. On the Malaysian side, the toll is RM7.50 (S$2.50). Price will not be the only factor in deciding which company wins the bid for the Kuala Lumpur-Singapore High Speed Rail (HSR), said Mr Lee, adding that other factors such as financing, track record and reliability will also count. There will be a "multi-dimensional assessment" of bids, said Datuk Seri Najib. The two leaders were asked about the selection criteria, following a news report that said the Japanese government would help a Japanese consortium in its bid for the HSR project. Mr Lee said there will be "a systematic process to come to a recommendation and a decision". He added that keeping it transparent and honest will give people the confidence that the call was made "without intending to favour or to hurt any side". A memorandum of understanding for educational cooperation between both countries was renewed. In a joint statement, the prime ministers said the agreement, which builds on efforts over the past 10 years, will provide opportunities for officials, educators and students from both countries to carry out exchanges and collaborations on matters of mutual interest. Singapore and Kuala Lumpur could potentially be linked up as smart cities, Mr Najib suggested as he pointed to the themes of resilience and innovation that Singapore has chosen as the chair of ASEAN this year. Expressing Malaysia's full support for Singapore's chairmanship of the grouping, he said that the emphasis on the digital economy is something both countries can work on together. He added that Singapore and Malaysia can promote regulations and e-commerce, and encourage electronic payments. Mr Lee had announced previously that Singapore plans to promote schemes to help ASEAN member economies innovate and use technology. In the heart of Singapore's Marina Bay district, a gleaming complex of steel and glass buildings soar 30 storeys high. 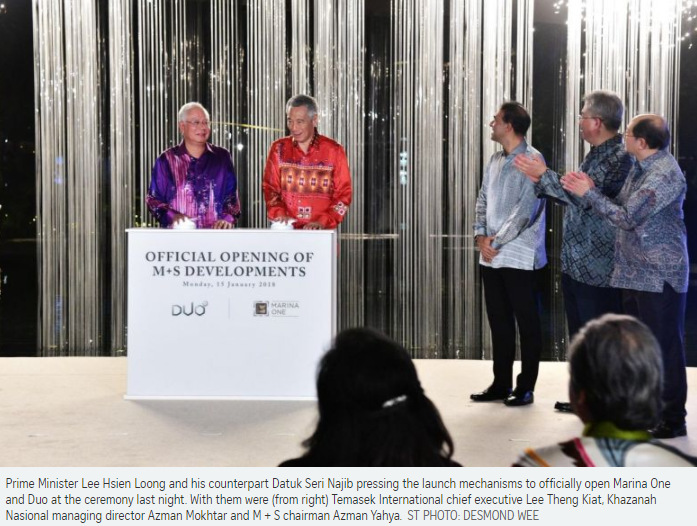 Last evening, Marina One was officially opened by both Singapore Prime Minister Lee Hsien Loong and Malaysian Prime Minister Najib Razak. At the same time, Duo, a mixed-use development in the nearby Ophir-Rochor district, was lit up to mark its official opening too. The developments are the outcome of a historic pact between Singapore and Malaysia in 2010 and reflect the turn in the ties between the two neighbours after a 20-year impasse. During the deadlock, they wrangled over plots of railway land in Singapore that Malaysia had previously controlled. Eventually, in return for the three plots and another three plots in Bukit Timah, Singapore offered four parcels of land in Marina South and two parcels of land in Ophir-Rochor for development. M+S, a joint venture company by Malaysia's Khazanah Nasional and Singapore's Temasek Holdings, developed Marina One and Duo on the six land parcels. Both are integrated developments that include office, residential and retail spaces. M+S chairman Azman Yahya said: "We hope that these two developments will serve as lasting visible symbols of the harmonious bilateral ties shared between our two countries for future generations." He noted that the projects are "symbolic of the longstanding strong partnership between Malaysia and Singapore". The mixed-use projects have a combined gross development value of about $11 billion. 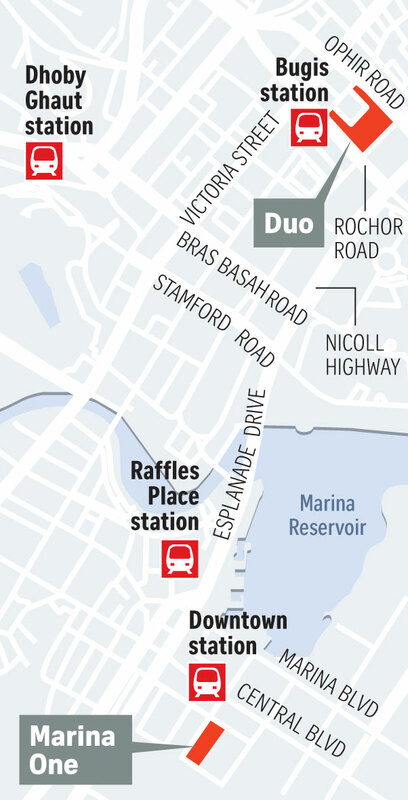 Marina One's tenants include Swiss private bank Julius Baer and consulting firm PwC Singapore, while Duo houses Andaz Singapore, a high-end hotel brand in the Hyatt chain. Datuk Seri Najib, who arrived in Singapore yesterday, attended the joint opening of Marina One and Duo ahead of the eighth Singapore-Malaysia leaders' retreat today. He also called on President Halimah Yacob at the Istana for the first time since she took office, and was hosted to a private dinner by Mr and Mrs Lee. The two PMs have held leaders' retreats almost every year since Mr Najib came to Singapore on an introductory visit in 2009. The latest meeting, originally scheduled for last month, was postponed at Mr Najib's request because of a special meeting of the Organisation of Islamic Cooperation in Turkey to discuss the United States' move to recognise Jerusalem as the capital of Israel. The two PMs and their delegations will hold discussions today. Both men will witness the signing of an agreement for the Johor Baru-Singapore Rapid Transit System (RTS) Link by Coordinating Minister for Infrastructure and Minister for Transport Khaw Boon Wan and Malaysian Minister in the Prime Minister's Department Abdul Rahman Dahlan. "The RTS Link will help to boost connectivity, strengthen our economic and business links and enhance people-to-people relations," Singapore's Foreign Ministry said in a statement. It also said the leaders' retreat is the key platform for both PMs to review progress in ties and set the direction going forward. These meetings have yielded major breakthroughs, like the announcement of the high-speed rail line between Singapore and Kuala Lumpur in 2013. Singapore's delegation includes Deputy Prime Minister Teo Chee Hean and other Cabinet ministers such as Mr Khaw and Foreign Minister Vivian Balakrishnan. Mr Najib is accompanied by a high-level delegation that includes Foreign Minister Anifah Aman, Transport Minister Liow Tiong Lai and International Trade and Industry Minister Mustapa Mohamed.